If you’re just starting out on the Gamestar Mechanic site, you should compose a mechanic biography, or, officially, a mechanic bio. This biography is visible to everyone who views your workshop, so take a little time to describe who you are. Click the Workshop button at the top of the page. The Workshop appears. In the Mechanic Profile box, you’ll see a section labeled Mechanic Bio. Click the Edit button under About the Mechanic. The Edit Profile page appears. Type your user bio and favorite games in the appropriate text boxes. You’re briefly defining yourself. Both fields must be, at most, 200 characters — the length of this bullet point. This is your face online; write something that gives users a good idea of who you are. You’re among game designers. Saying that you’re interested in game design isn’t exactly interesting here. Be more specific, or describe your other interests. You’re in a safe environment. 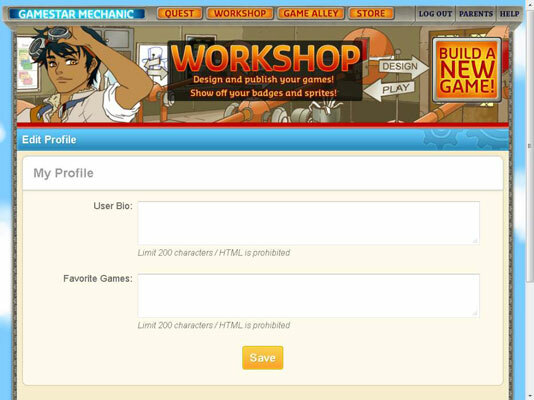 Gamestar Mechanic is for all ages — express your interests freely, but also respect the expressions of others. You may find others with similar interests. The Favorite Earth Games section of your Mechanic Bio is a good way to connect with people who have similar interests in gaming. The style of your writing translates to that of your character. Many people like to post enthusiastic biographies with lots of exclamation points, or apathetic biographies consisting of single unpunctuated words. Your writing style can say a lot about whether you’re cheerful, blunt, or formal, for example. Define yourself the way you want to be defined. Avoid poor grammar, which can sabotage your portrait. You can always edit your bio later if you want to make changes.